On the hill above Cruz Bay on St. John, the house where Eugenio Santana Santana, 61, was living was completely blown away by Hurricane Irma. I can't tell you what it sounds like when winds from a 185 mph Category 5 hurricane blow your roof off. But I have friends on St. John in the U.S. Virgin Islands who can tell you, or, rather, could tell you if they had phone service, or could get online for more than a minute or two. But a month after Hurricane Irma assaulted the island — with Maria right behind to finish the job — they still can't. I can tell you what it sounds like after those life-threatening winds subside. For almost 48 harrowing hours after the eye of Irma passed, there is virtually no communication with Coral Bay, the more isolated of St. John's two communities. Then bits of information trickle in. 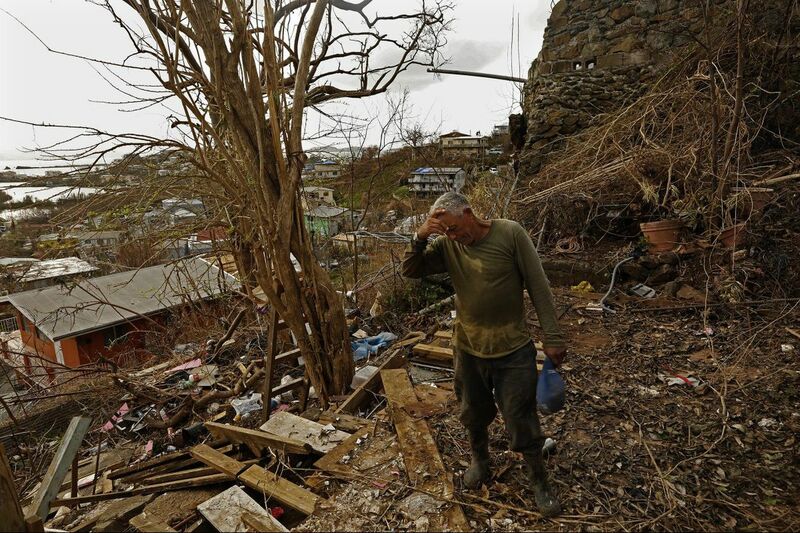 Someone walks nine miles to the main town of Cruz Bay to find power and a cell signal. Someone waits in line for six hours to make a one-minute call on a satellite phone. Someone manages to transmit a photo of what appears to be a giant piece of cardboard on which survivors have scrawled their names. The names of those who called — or scrawled — are shared on social media by family, neighbors, and former residents like me, desperate for news. Today, as more victims of one of the most powerful one-two punches in Atlantic hurricane history find a voice, the sound coming from St. John has escalated to a bewildered Seussian plea, like all those Whos on Horton's dust mite shouting together: We are here! We are here! We are here! WE ARE HERE! St. John is a very small place. Two-thirds national park, it is beloved for its pristine beaches, technicolor fish, coral reefs, and, until Sept. 6, luxuriant foliage and lush hiking trails. It has no airport or cruise ship dock. It is difficult to find on the map, and hard to get to — even harder than Puerto Rico, now suffering from its own humanitarian crisis in the wake of Hurricane Maria. St. John is tight-knit, nicknamed Love City. About 4,000 people live on the island year-round. Most of them are not rich and do not live in the million-dollar villas that (used to) dot the hillsides. If they own a boat, it is likely to be their business or their home. Most of those floating businesses are gone, another casualty of a spectacularly demolished economy. St. Johnians don't want undue consideration. They know their Caribbean neighbors — including fellow Americans in St. Thomas, St. Croix, and Puerto Rico — need help, too. They would be the helpers if they weren't in such desperate need themselves. Some St. Johnians were on Hurricane Harvey relief missions when Irma hit, just as many spent their "vacations" in New Orleans when Katrina struck in 2005. That was the year I tried to write a story on hurricane preparedness for the St. John Sun Times. My willful and independent neighbors didn't want to talk about it. Many had lived through Marilyn in 1995 and Hugo in 1989. Too many superstitions. But when it came time to prepare myself, I'll never forget how one of those neighbors followed me around the Kmart, inspecting my cart to make sure I had the right supplies. That's how St. Johnians look out for each other. This time, though, they need someone to look out for them. It will be months, if not years, before life returns to any sort of normalcy. This time, they need to talk about it. They are trying to raise that collective voice: We are here!